I’m going to employ the clichés of all clichés and say that time really does fly. This time last year I was in full essay-writing frenzy and manically trying to organise my life. I was so worried my dreams wouldn’t come true. Fast forward and here I am, living in Scotland, a country that feels more like home to me than my own native land, and I’m doing the same thing I was last year–watching essay deadlines loom ever closer. Except this year, on top of there being more assignments, there are also more parties. Because this is the end–I will never be a student again. None of that ‘never say never’ nonsense, this is it, for real. I’m done living on a teensy budget. I’m done wishing and waiting on the day. I want to be a real grown-up now. But you can’t quit the student life without a lot of parties to celebrate all the wild days (ha, who am I kidding–my ideal Friday night is a box of chocolates and a period drama on telly), which means a lot of lost sleep, and my essay is due in a week and I’ve hardly done a thing for it and I am now suitably freaking out. So this is where cake comes in. 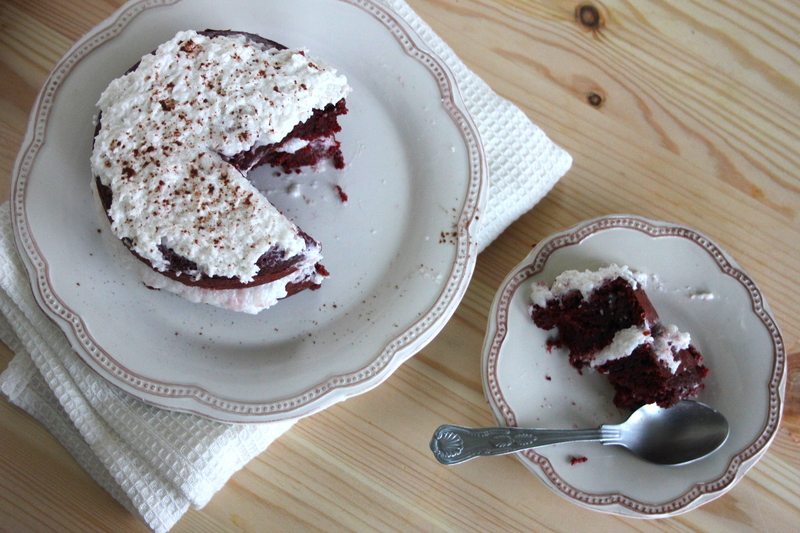 Cake is the answer to every woe and sorrow and of course it cures sleep deprivation. Sometimes I don’t feel like sharing. 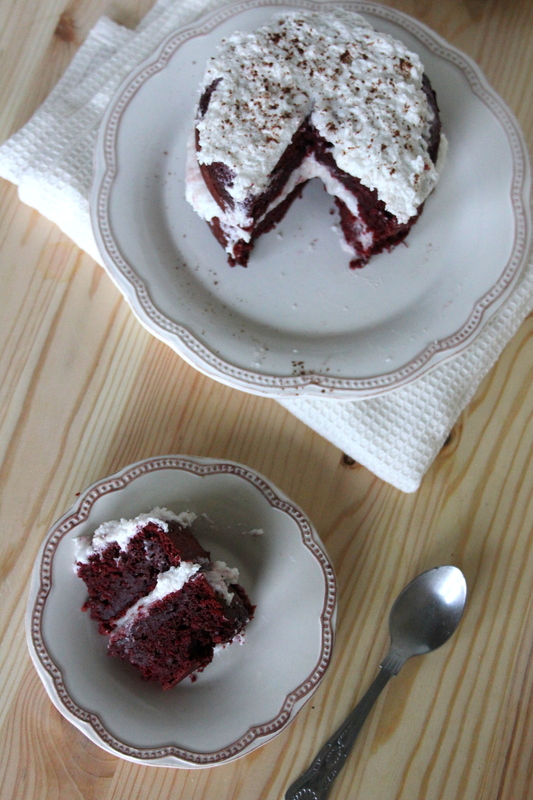 Sometimes I want a wee cake all to myself–and yes I may or may not eat some for breakfast. If you’re wondering how I made such a tiny cake, I used these tins. When I say this makes four servings, I mean it makes four servings for you. Adapted from this recipe by Dessert With Benefits. For the beetroot puree: roast the beetroots in their skins, wrapped in tin foil, for an hour at 200ºC (400ºC). Leave to cool for a few minutes before removing them from their skins and roughly chopping them up. Puree in a food processor, adding the soya milk and lemon juice to help the process. For the cake: Lower the temperature of the oven to 180ºC (350ºF). Grease two 12cm (6 inch) springform cake tins. Sift the dry ingredients into a medium-sized bowl. Whisk together the wet ingredients in another, then fold into the dry ingredients until just incorporated. The batter should be fairly liquid and evenly combined, with no lumps remaining. Divide the batter evenly between the tins. Bake for 35 minutes at 180ºC (350ºF). Cool on a wire rack. Remove from the tins and spread coconut cream frosting on one of the cakes; sandwich the other cake on top and cover with the remainder of the cream. Whisk the ingredients together in a small bowl, then refrigerate for at least an hour. The psyllium husk will make the frosting hold up more strongly, especially when it is sandwiches between the two cakes, but you can leave it out. What’s your go-to recipe when you’re freaking out? Wonderful blog! I will definitely be trying these recipes. Thank you for sharing them! 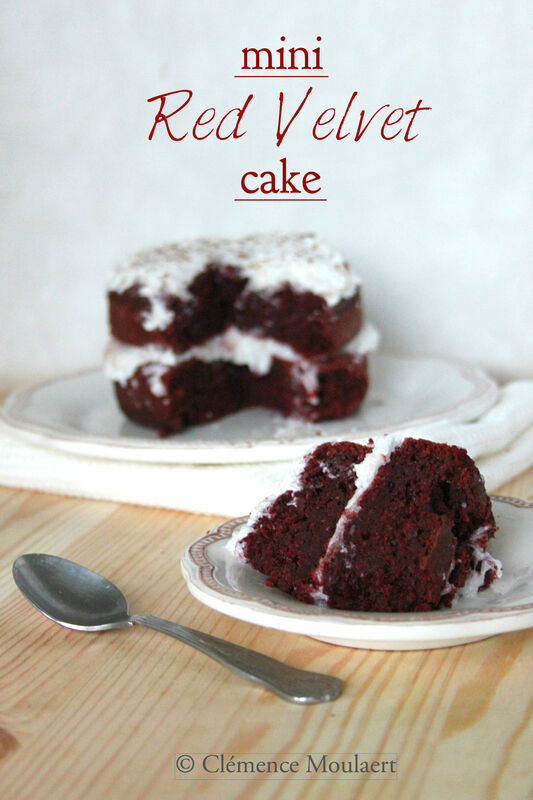 I don’t like beets much but they work great in baking! The flavour is masked by the other ingredients and their colour is a great bonus. 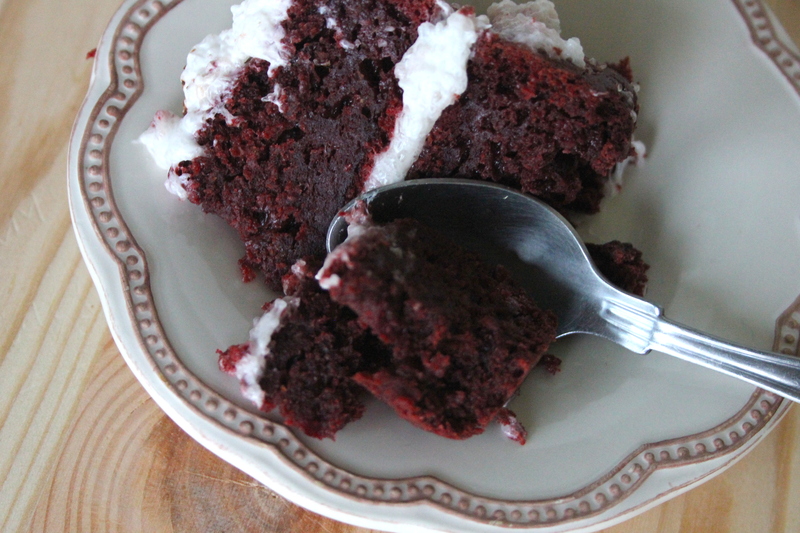 I’ve made chocolate beet cake too if you’re interested in trying it. OMG YUM!! 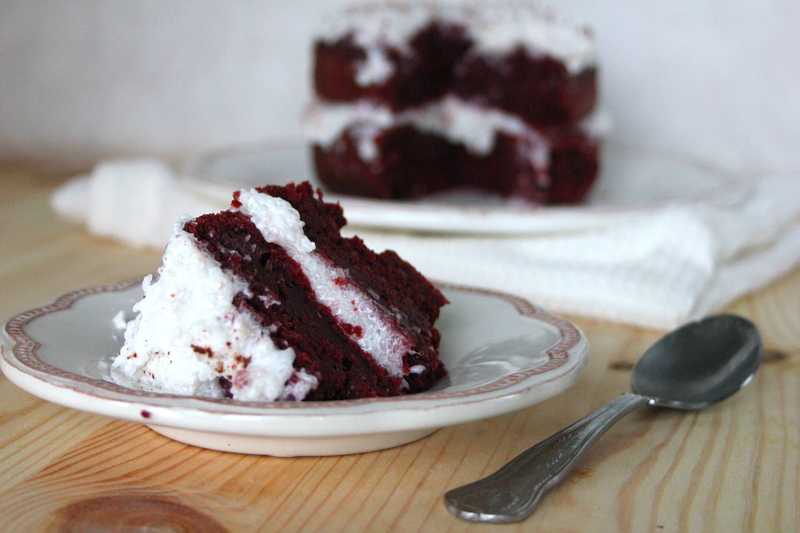 Your mini red velvet cakes look so good! Thank you!! There’s one more mini cake coming this week, and it’s a reaaaally good one 🙂 It’s blissful being done with your studies, but daunting to find work now!